Because of its beautiful nature and cultural heritage, island of Korcula is one of the most attractive islands on the Mediterranean. Cost length is 182 km with 195 bays and archipelago counting 48 smaller islands. Island has calm Mediterranean climate during whole year. Korcula is the island with the wealthiest vegetation on Adriatic and it is kind of ecological paradise on Mediterranean. It's all covered with hundreds species of aromatic Mediterranean plants and centenary forests what explains ancient Greek name for Korcula, Korkyra Melaina (Black Korcula). Town KORCULA is one of the best preserved medieval towns in the Mediterranean. According to legend, Korcula is the hometown of the famous sailor Marco Polo. There is also a lot of Romanesque, Gothic and Renaissance cultural heritage. Also tourist can see Moreska, dance originally from Spain, which has been traditionally performed since the 15th century. BLATO, a town in the interior of the island of Korcula, 4 kilometers from the sea. It is the economic center of the island and it's famous by its architecture and dozens of Romanic churches. long the town, there is a gorgeous alley of linden trees, more than 1 km long, so it makes a very special experience to walk through in June, when the linden is blooming. 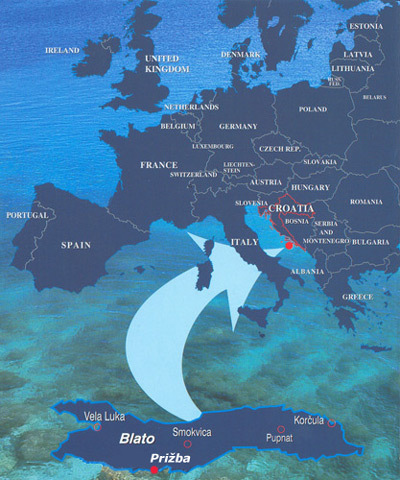 Blato has sanctuary of Maria Petkovic of Crucified Jesus who was beatified by Pope John Paul II in Dubrovnik. Attraction for tourists is Kumpanjija, old sword dance performed by the knights association established in 1927. 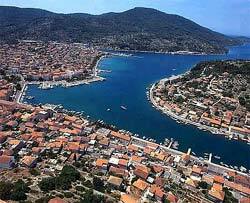 VELA LUKA, a town and port on the western side of the island of Korcula, 45 km to the west of the town of Korcula. It is famous for its beautiful „lungomare“ and offers a variety attractions for tourist, specially for younger.